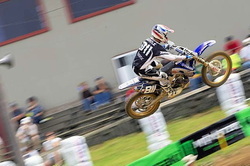 Check out my teammate Brennen Weindel keepin the two strokes alive! Well my cylinder was sent off to Millenium tech... $300 later and they have done an awesome job. Unfortunately the bike had sit so long the linkage froze up... Time to get those bearings unstuck and replaced. Blowtorch perhaps? After I get the linkage put back together, I think I may make a time lapse video of putting the bike back together, and the first start up. With the advancing bikes and changing tracks, the sport is becoming more dangerous whether we like it or not. Thus the results are more fatalities in the motocross world. The more I thought about this, the more I wanted to make a video to not only point this out, but to remember those who have fallen. My whole idea behind this video was; miss them, but don't be sad. Remember the lives they lived! P.S. The pictured rider is Lichtle. This site is where you can catch up on all of my latest video's, photo's and news. I made this site because I decided that I need a place where I can post everything in one organized website. On the main page you will find my latest news and latest video. In the other tab's on this website I have placed sections for all of my videos and other work. Ranging from motocross racing, to Mx Simulator. I am a big fan of two strokes so I will be posting a lot about them. I will always post the latest work at the top, and oldest at the bottom of every tab, so one can see the progress of my work through time. Feel free to comment on my work anytime using one of the links below.